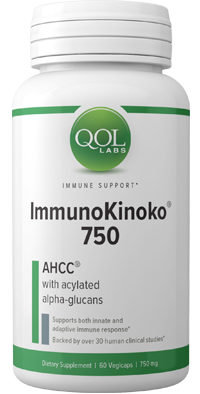 QOL Labs ImmunoKinoko 750 features AHCC – a breakthrough compound for nutritional immune system support. AHCC has been rigorously studied at some of the most credible medical and scientific institutions. The results have been promising so far, showing that AHCC may aid in the healthy proliferation of T cells and other crucial aspects of a functional immune response. Purchasing this product today earns you 85 DR Reward Points! May help maintain the proliferation T cells, dendritic cells, leukocytes, and other important aspects of a healthy immune response. T cells are essential to neutralizing infected cells before infections can spread. AHCC is a natural extract which is derived from mushrooms. Supported by over 30 human clinical studies at respected medical institutions. One of the most exciting new immune system booster ingredients. A top-selling immune support ingredient in Japan – one of the world’s healthiest nations! Supplements which are marketed as providing support for the immune system tend to be limited in their contents to common antioxidant and probiotic ingredients. Each of these ingredient types are capable of providing indirect support for the immune system by neutralizing free radicals and protecting the digestive tract from bacteria and toxins in food and beverages. This makes them useful ingredients for indirect immune support, but neither type has a directly measurable effect on actual immune response. It’s critically important to eat a healthy diet that is rich in probiotics and antioxidants. However, there are some who struggle with deficiencies in their immune system functionality which may leave their body more susceptible to infection from all manner of parasites, regardless of their dietary choices. One ingredient which has been extensively studied and verified for actual immune support is Active Hexose Correlated Compound (AHCC). AHCC, the active ingredient in ImmunoKinoko®, is an extract obtained from a hybridization of several subspecies of medicinal mushrooms. Its effects and potential benefits have been the subject of over 30 human clinical studies at respected medical institutions — including Yale Medical School, MD Anderson, UC Davis, and the Harvard-affiliated Brigham and Women’s Hospital. Studies surrounding the the effects of AHCC supplementation on immune response have centered around its effect on T cell activation. T cells are lymphocytes (a subtype of white blood cells) which are released from the thyroid gland in response to a variety of antigens. They are some of the most important facets of a healthy immune system. This is because they play a pivotal role in protecting other cells in the body from all manner of potential harms. Ironically, most T cells achieve this by seeking out and killing cells which have become infected, so as to prevent any infections from spreading. One study hypothesize that this occurs as a result of AHCC aiding in cell adhesion – a critical factor in the activation and survival pathway of lymphocytes.3 As such, AHCC may provide additional support for an already healthy immune system. Take 2-4 vegicaps daily before meals or as directed by your healthcare professional.